As I explained in Mayan Astrology, the Mayan Astrology Calendar, or tzolkin, contains 260 days. These 260 days are broken down into groups of 20 days, called day-signs, which are similar to Mayan Zodiac Signs, or Sun Signs, if you're familiar with Western Astrology. 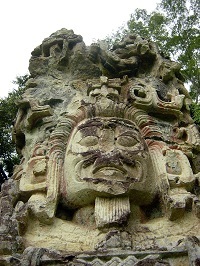 However, the Mayan Astrology Calendar further divides the days into 20 groups of thirteen days, called trecenas. Trecenas reveal deeper aspects of your personality than a day-sign reveals. They're kind of like Western Astrology's Moon Sign in that they cover your emotions, your connections to others and society, and how you respond to things. The moon was important to the Mayans, and the number thirteen was a very important number in Mexican astrology. The trecenas correlate with how the moon travels in one day the same amount of distance the sun travels in thirteen days. The moon also travels thirteen degrees of the zodiac every day. It shouldn't surprise you that the word trecena is actually Spanish for thirteenth. That's how important both the number thirteen and a person's trecena are. In order to understand trecenas, it might be easier to think of the 20 groups of thirteen days as 20 weeks of thirteen days. Like the day-signs, each trecena was also ruled by a deity. Trecenas appear to be connected to world events, meaning whatever personality traits are connected to the day-sign that gives the trecena its name, those are the traits that will appear in the news. For example, one of the characteristics of Aj is a thirst for knowledge. During a trecena of “1-Aj,” information might become public knowledge. It's because of this influence on events that the Mayans used trecenas to predict when it would be the best time to do things. But the quality of trecenas that probably interests you the most is what they tell you about someone's personality. To use Mayan Astrology to understand someone, you don't want to look just at their day-sign, but you also want to see where their day-sign falls in the trecenas. For example, someone born on 2-E was born on the second day of the trecena 1-B'atz and has E as their day-sign. E would describe their dominant personality – a natural leader, great communicator, and very caring. On a secondary level, B'atz gives them the qualities of being driven and wanting only the best. On another level, you have the directions. E is the West and B'atz is the East. This person could be torn between taking action to make things happen and working with others to reach an agreeable solution.